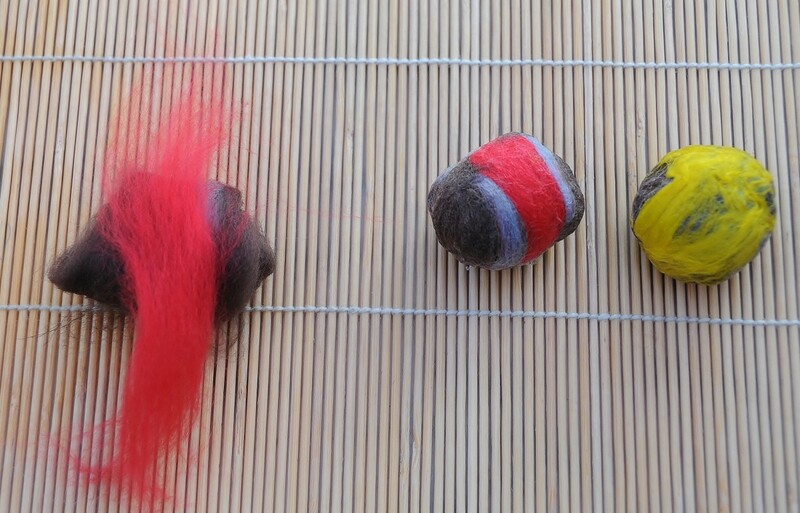 Making felt beads is one of the easiest felt making Projects you can do, making them as described below makes it a breeze, even a child could be taught how with just a little adult supervision. Add a few recycled charm bracelets to the mix and you will soon have the youngsters teaching each other how to make simple but charming gifts at just a fraction of store-bought jewellery. The beads can be made into necklaces, bracelets and earrings. 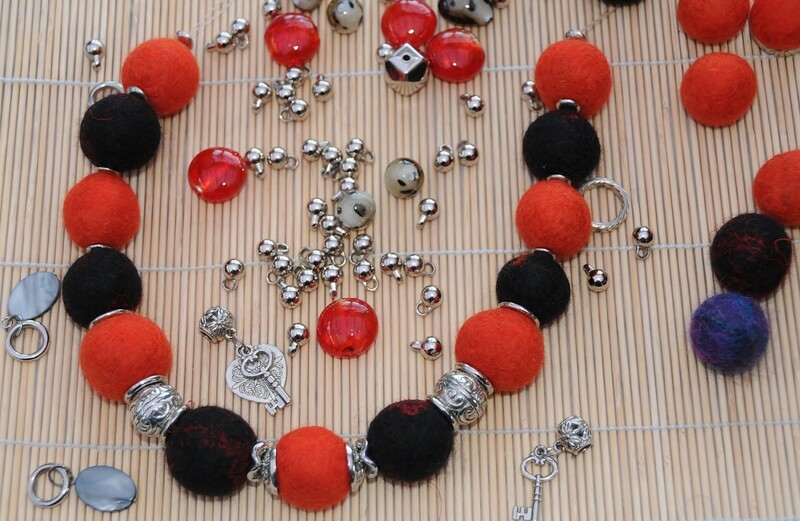 Woolen beads with lots of charm! 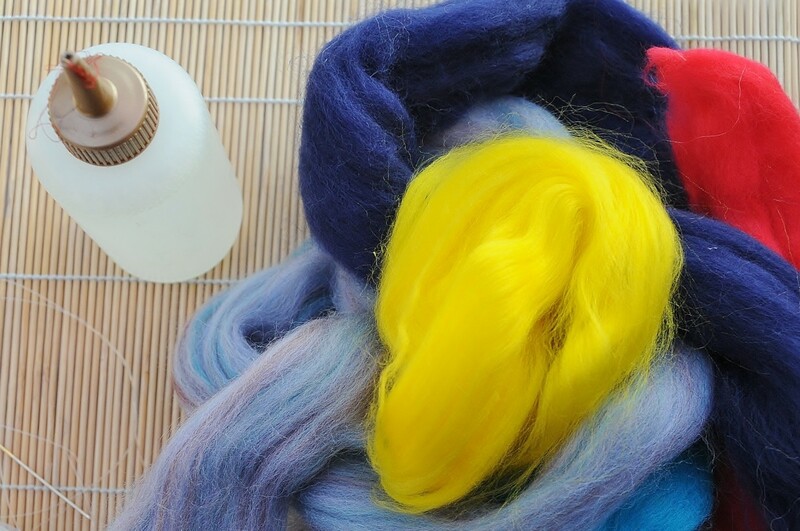 A quantity of merino wool roving in your choice of lovely bright colors. A small quantity of dish washing liquid or grated olive oil soap dissolved in hot water. 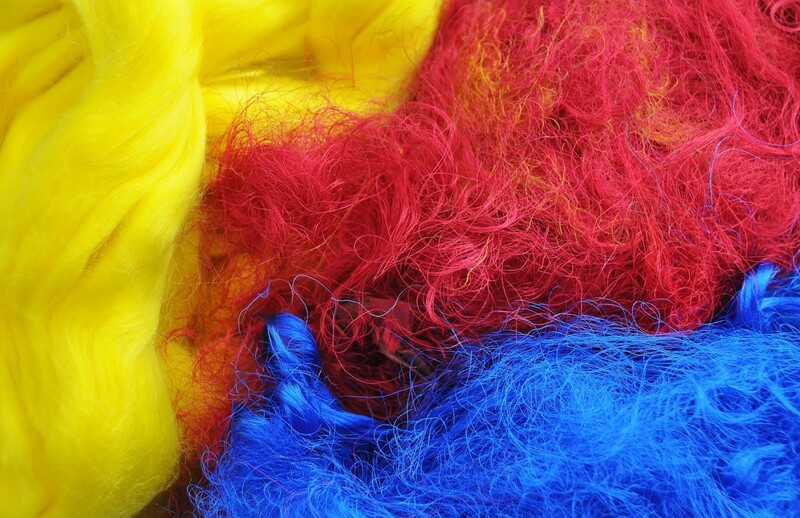 Silk threads or bits of silk roving which can be used to embellish the beads during the creation of the beads. Elastic suitable for threading jewelry. Shirring elastic can be used. Thin strips of leather or ribbon for threading if preferred. 2 Large eyed sewing needles for threading the elastic. Use one needle on each end of the threaded elastic. It helps to be able to thread both sides of the necklace at the same time. 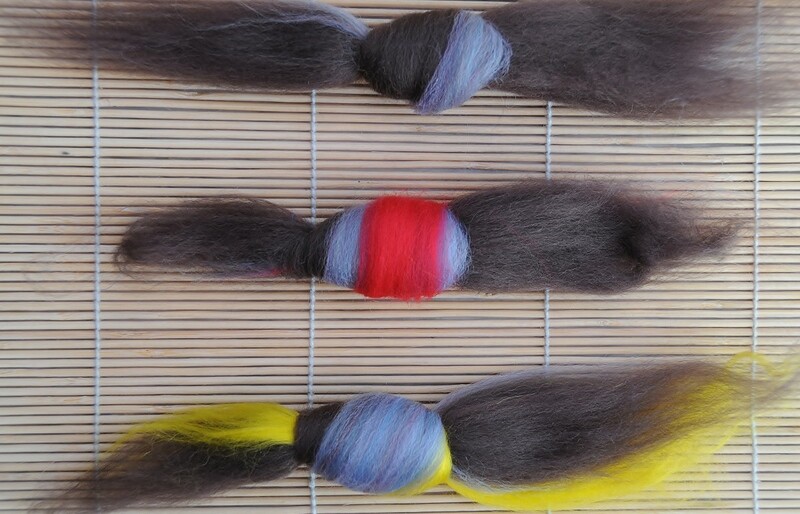 A little silk embroidery thread for embroidered felt beads, if desired. 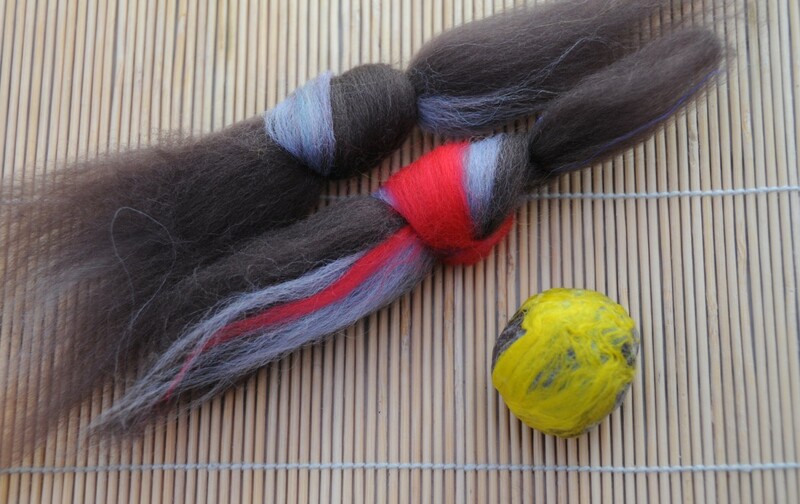 Pull off a piece of wool roving as shown above. The amount which has been pulled off equates to three beads. The finished size of each bead will end up being the size of a large cherry. You can weigh the beads if you want each one exactly the same size..
Add a little color if preferred and tie a knot in the wool roving as shown. 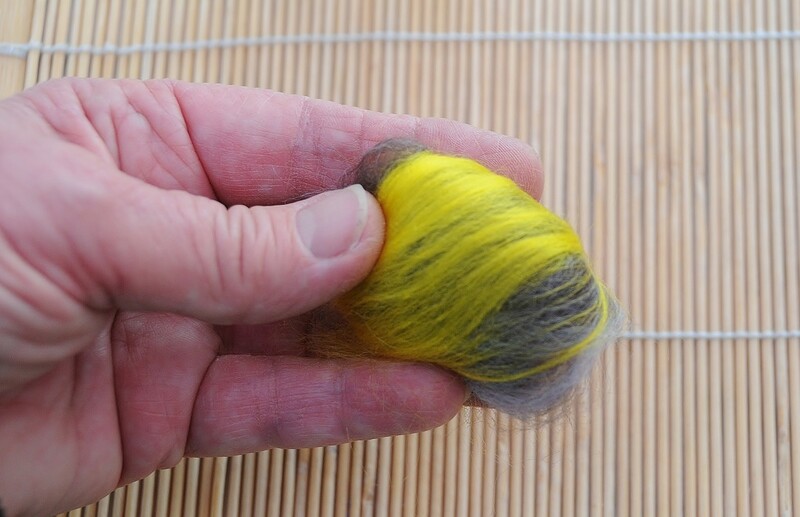 Fold in the loose wool roving until you have a nice round ball shape. 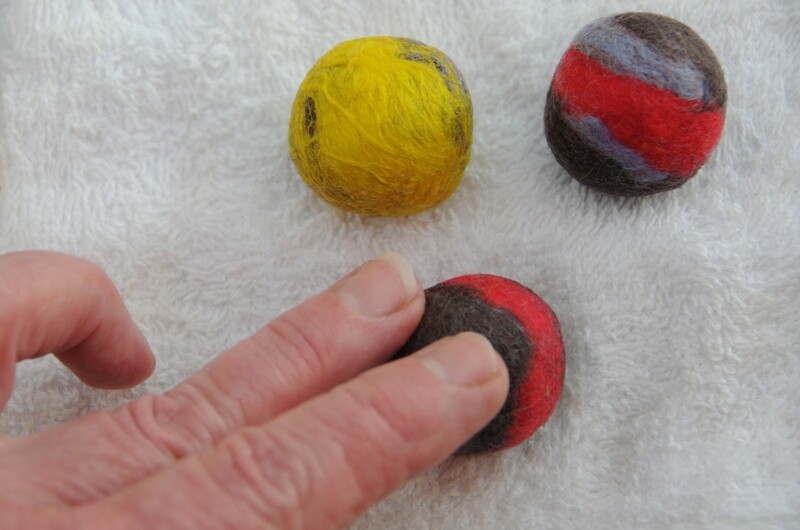 Add a little hot soapy water to the ball and then roll gently in your cupped hand. Roll gently at first until you have a round ball shape. After rolling the first ball, continue with making the next two beads. It is possible to roll around four to five per hand, especially as you grow more accustomed to working with more beads at a time. 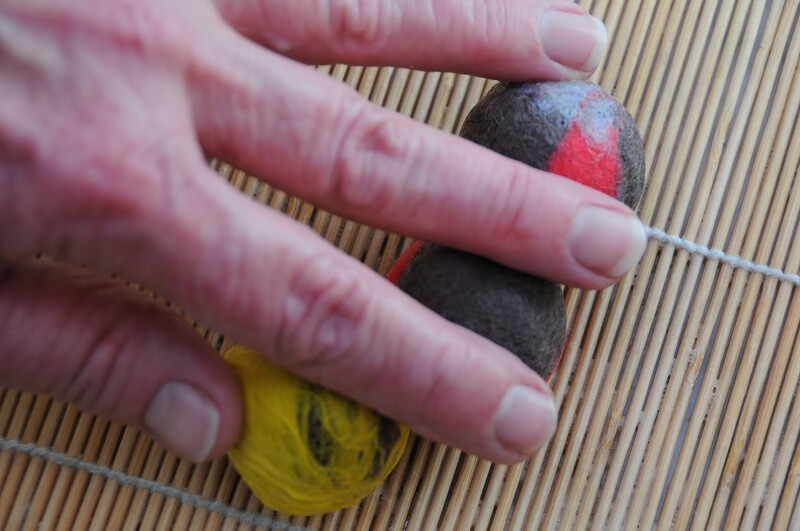 Add a small quantity of hot soapy water to the ball and begin rolling in the palm of your hand. Only add a little soapy water at a time, just sufficient to wet the ball without saturating it. Roll more than one bead at a time! Roll several beads at a time, if you feel so inclined. This really does help to speed up the whole process. Getting a little too soapy! Sometimes when you roll the little beads on the sushi mat, they become a little soapy. If they do, roll the ball on a kitchen tea towel. A final rinse in hot and then cold water! Rinse the beads in hot water and then cold water until the water runs clear. Give a final rub on a clean dry sushi mat. This will remove any excess water. Dry and thread the necklace as shown. Want to make different shaped beads! Roll the beads lengthwise to create long beads. Begin shaping by rolling the ends of the ball on the sushi mat. To make a disc-shaped bead, hit the rounded ball with something heavy until it becomes flattened. A small hammer will do the trick. 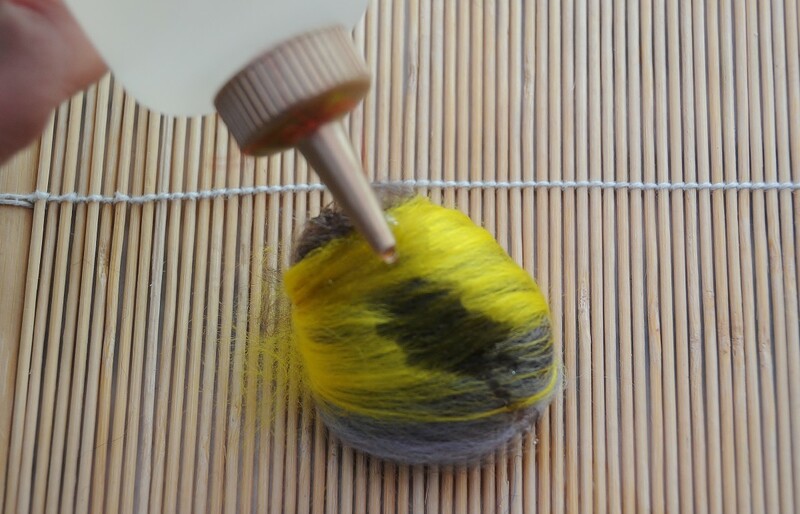 For variegated beads use roving which either comes in mixed colors or add your own color and texture to the top layer before you start rolling. 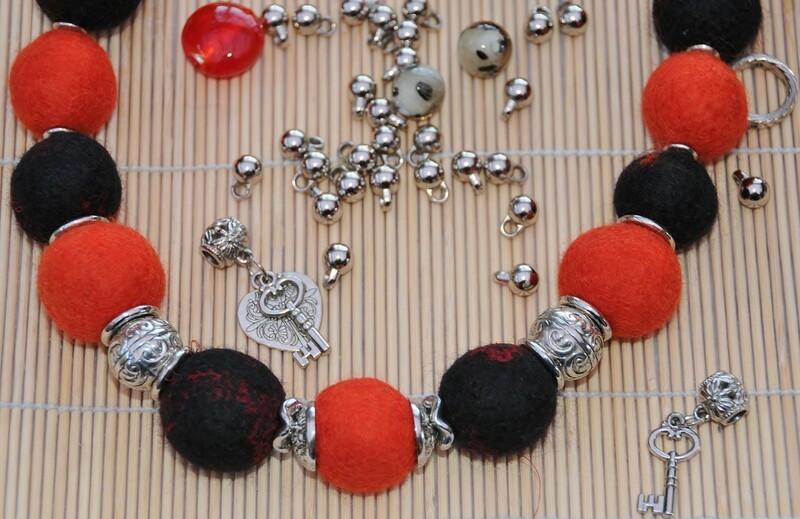 A simple bracelet can be made with felt beads and shirring elastic or elastic bought specifically for threading beads. First, measure the wrist of the recipient and add the correct number of beads for the length of elastic. 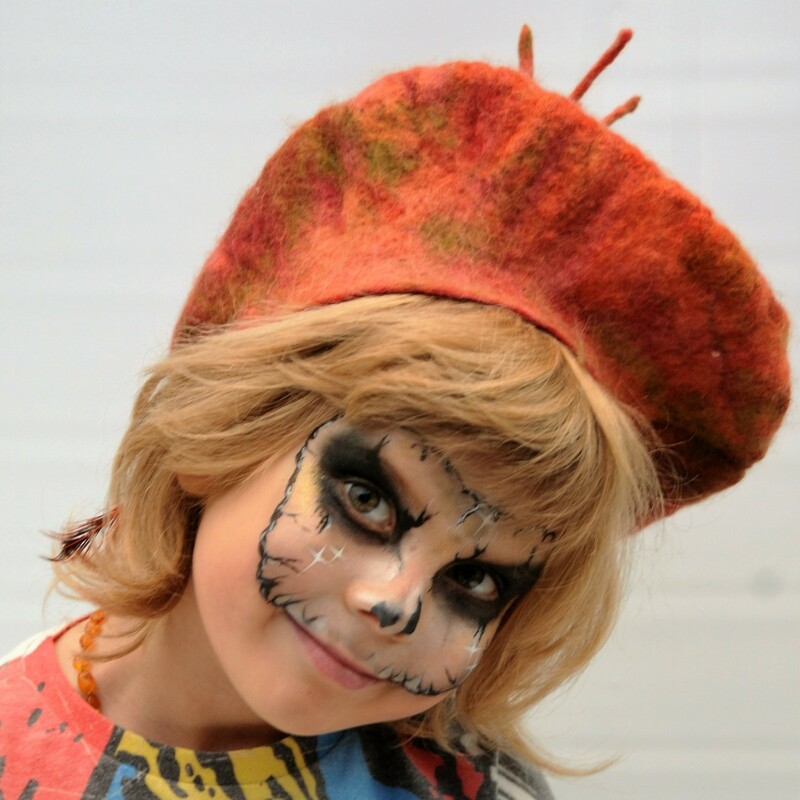 Add sufficient felt beads and/or a mix of felt, metal or glass beads to compliment the color scheme. Use a thin pointed needle with a large eye for threading the elastic. 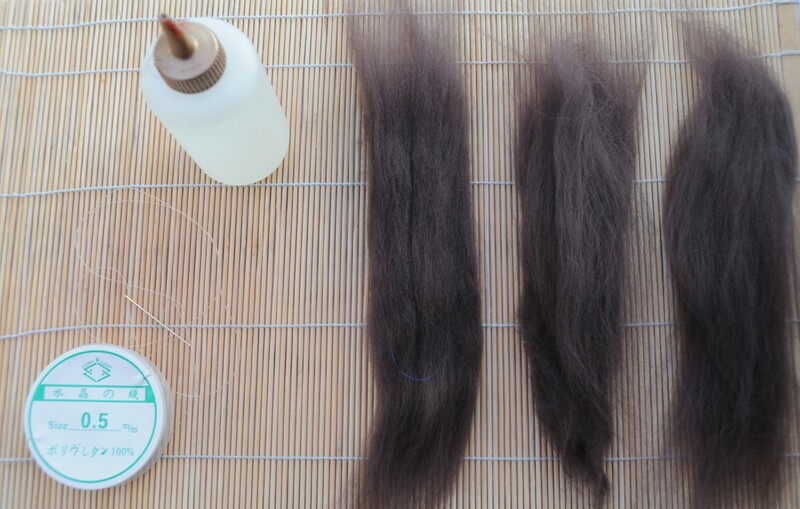 A double thread should be used for extra strength. A thick darning needle may well be needed to thread-thin strips of the leather but use a needle which has a sharp point. A blunt or rounded needle makes it difficult to penetrate the beads. You may need to use pliers to pull the leather through. Add to the end of hair clips for decoration. 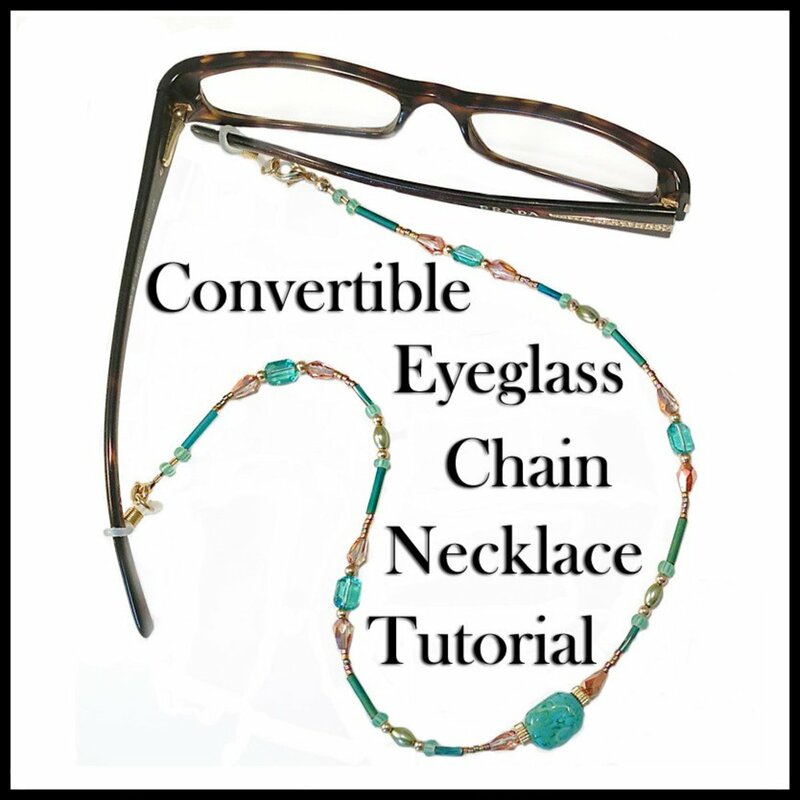 Combine with glass or ceramic beads or even silver beads to make your own custom made jewelry. This bracelet was made from plain, round felt beads and metal beads.from some cheap charm bracelets. The felt beads shown here are the size of large cherries. A simple metal choker can be used instead, just add a few felt beads to the lower part. A length of ribbon can be used instead of elastic. 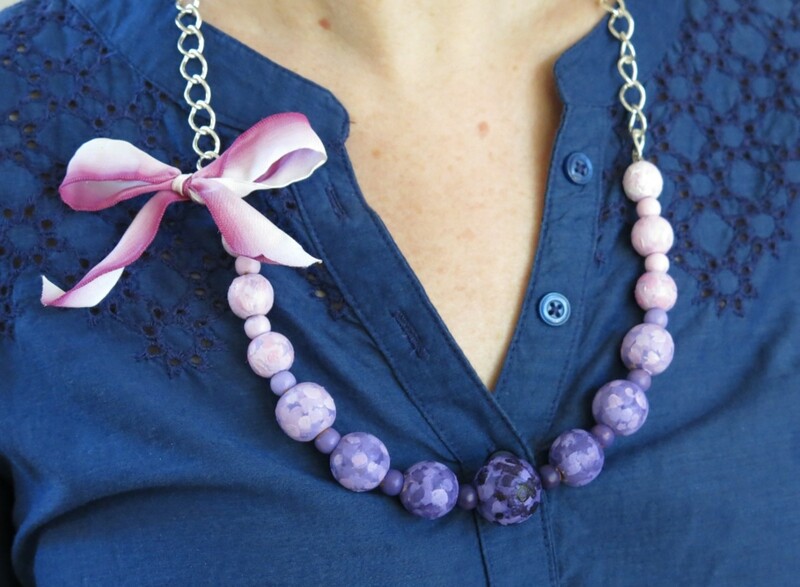 Tie the end into a bow around the neck to complete the necklace. 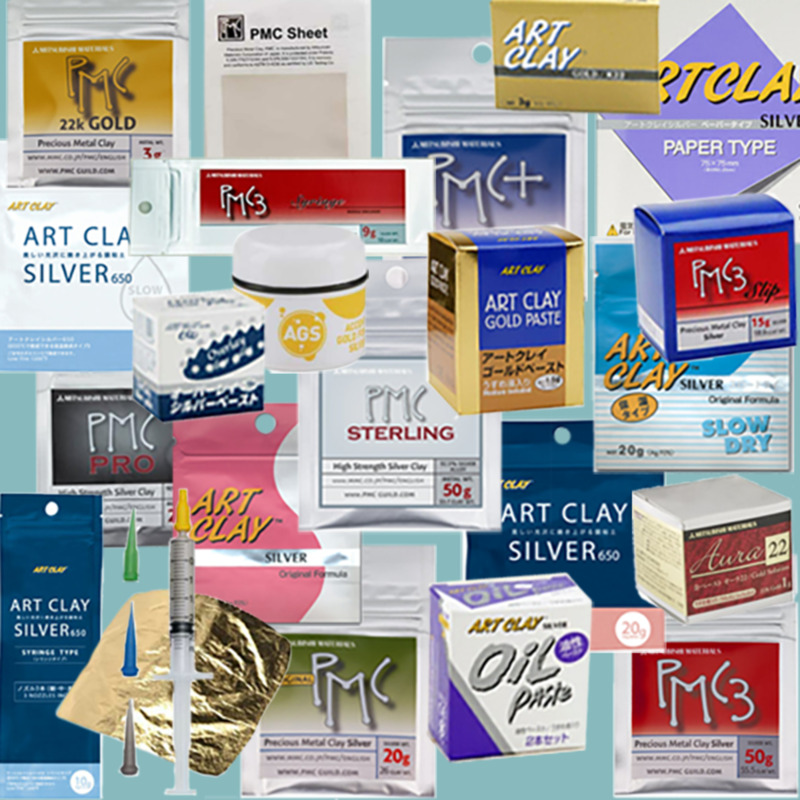 Jewelry findings can be found online at Amazon or e-Bay very cheaply. 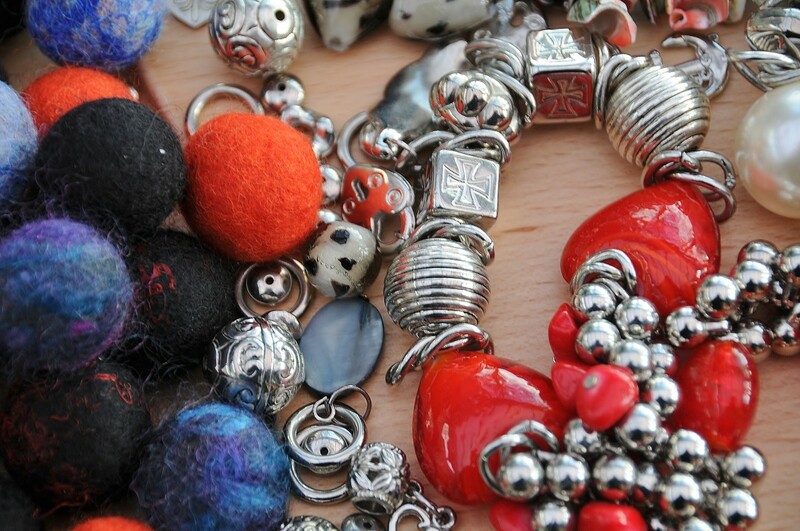 I also like to buy used charm bracelets from thrift stores and combine the metal or glass beads with the felt beads. To make a simple necklace, poke a hole in each felt bead with a thick darning needle, You may need to use pliers to pull the needle through the felt bead. Beading with glass beads, sequins etc. Felt beads can easily be embroidered with 2-3 strands of embroidery thread. Needle felt stripes or spots on the beads. 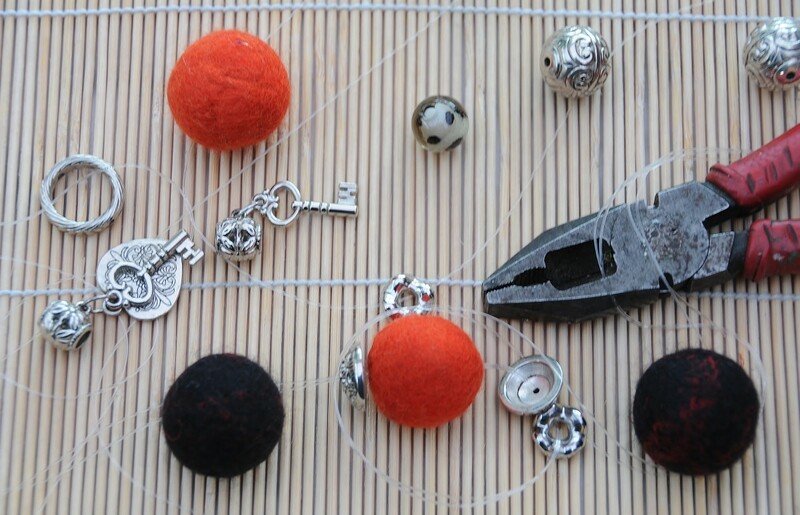 Felt beads can be wrapped with wire or crochet chains to ‘cage’ the beads. I hope this brief introduction to making felt beads will be the inspiration you need to make some unique hand crafted gifts. 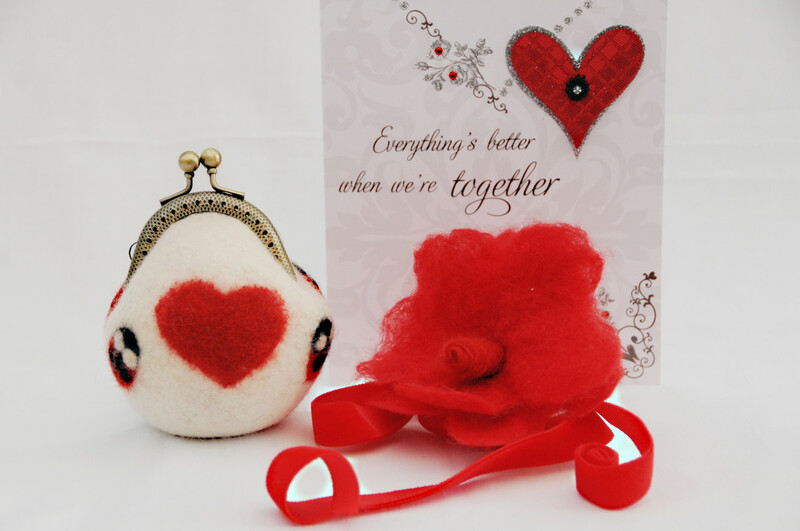 Do you like to receive gifts which have been hand crafted? I value hand made gifts much more than store bought items. I prefer receiving gifts which were store bought. Thank you for your comment. I am sorry for the delay in replying to it but for some reason it was marked as spam It clearly is not. Traditionally putting on a heart pendant on a beaded necklace gives the accessory piece an increasingly casual, entertaining and whimsical appearance. You are very welcome, I am glad you enjoyed this wet felting tutorial and I hope you enjoy making the felt bead necklace. Thanks so much for the share and the vote up - both are much appreciated. This is beautiful and I love the color combination. Wonderful and creative with helpful pictures and instructions. I would love to try this. Thanks for sharing and voted up! I am glad you found the instructions easy to follow. I hope that you will attempt this project as this is definitely one of the easiest and certainly one of the most rewarding, I appreciate the comment, thank you so much. Sally, this necklace is beautiful. You certainly do bring us the most interesting topics and your detailed instructions are easy to follow. One day I may just have to do one of these pretty felt creations. 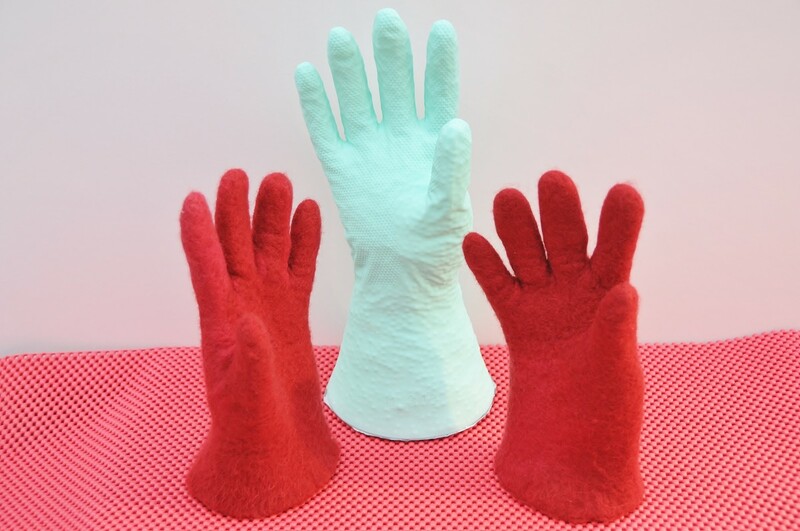 You are without a doubt the wet felting queen! These are beautiful and would made a really nice gift. Thanks for sharing. I love it. It is sooo creative! I think this is perhaps the one of the simplest but one of the nicest projects I have done to date. Whoever said that things have to be complicated in order to be nice! The charms bracelets certainly give the necklace an individual look but you could also add some silver jewelry findings if you were so inclined. The felt beads certainly come into their own with a little silver added. These would make great presents. Thanks again Jo for your continued support, awesome, shared etc., I am so appreciative. Now, if I can find some spare time to collect the materials and the time to make myself some really neat and one of a kind necklaces. This would be nice! :-) It is neat how you can change up the colors with the felt. Sally, that is really lovely! I have several friends and relatives who make their own jewelry. I passed your article on to them. I am always delighted to have you grace one of my pages. If you are able to help give some exposure to this craft by telling a friend or two about this project, that will be very nice! I know I loved creating this necklace, it is my hope that others will enjoy it too. What a charming necklace/bracelet! Will share with at least one person I know would be interested. Thanks for the exposure to these delightful crafts. Thanks for the visit, pin and comment. I hope you daughter finds this very useful. Quite a clever little project. My daughter makes all kinds of jewelry. I will have to show her this. Thank you so much! Your visits to my hubs are valued and appreciated. I made some more beads yesterday in some gorgeous tones of blue and aquamarine. I am thrilled with how they turned out. The potential for creativity using these felt balls is amazing. I can't wait to explore a few more ideas I have in my head. Just beautiful Sally - Love the vivid colors and boy I can see a nice long necklace with lots of beads on it. Great photos too! 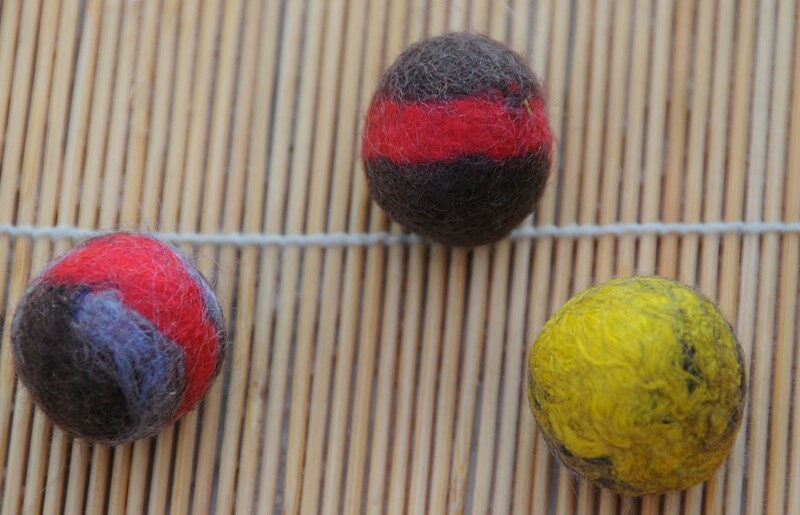 This is probably one of the easiest ways of making felt beads. I do hope that you begin your felt making journey with this tutorial because you could not start with a more satisfying project. I so appreciate your visit and your comment, especially the one regarding the video! thank you, it means a lot. Hi Sally, your hub caught my eye! I love to make jewelry with beads of all kinds, but have never used felt before! I love the idea of making your own beads, something I have been curious about for a while, but have never really branched out and done it. This is so neat, and interesting also. Its fun using a different texture altogether I am sure. I hope to try it sometime, and know where to go when I do! Your video was great as well, wonderful! Definitely worth a go, especially if you have some 'bling' at home waiting for a project like this. The felt beads are definitely enhanced by the silver beads. This is such an easy project. Even young children and teenagers might be interested in trying this craft if they can make something so simple, yet beautiful. Thanks for the vote up+ I really appreciate your stopping by to comment. There is no time like the present:) I really hope you do have a go. Your comment is valued and appreciated. Thank you.so much. I understand that hobbies like these can be time consuming but sometimes the need to create does overtakes and I do find myself having to make something for the pleasure of doing it. I guess it is a bit like an artist who has to paint! I appreciate your very kind comments, awesome, Hub share and tweet.. Thank you so much for your lovely comment. Thank you for stopping by. I don't have a lot for ladies to buy as I am more often than not writing about this craft than selling items. I hope to alter this situation soon as I intend putting some of them onto my own site. Good to hear that this project might be useful for you Phyllis. I particularly enjoyed your comment about hand crafted Christmas presents. I wish more people would do this. I love to receive something made especially for me. Thank you for the vote up etc., it is much appreciated. Thanks so much for the share on Twitter and Pin. I grow increasing interested in this art form. It is quite magical. I adore the colors one gets to work with. Thank you very much for your very kind comments plus Voted up, useful, beautiful, and interesting. Thank you too for the vote up, beautiful and interesting. I've been wanting to play with felted beads for a while now. 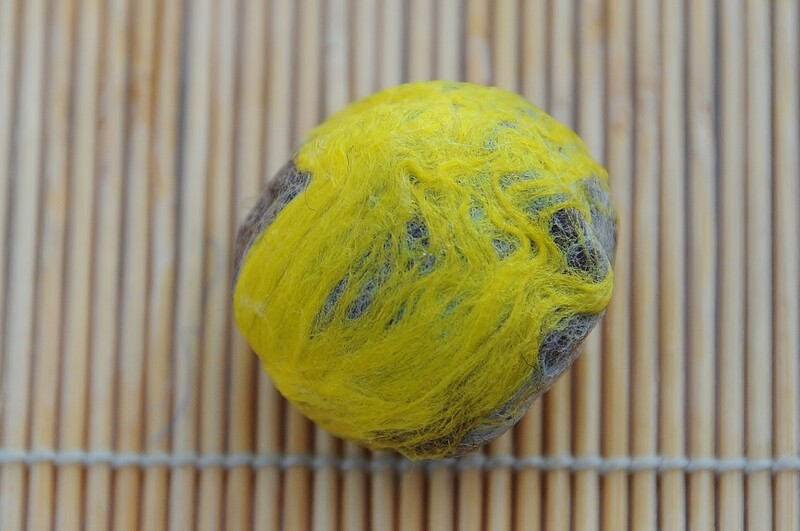 I also want to do some felted soaps. This is marvelous. It's so beautiful! I love the red and black combination. When I was a teenager, I loved doing stuff like this that are time consuming. Now I would rather purchase one than taking the time out to make one, Awesome Hub! Shared on twitter. 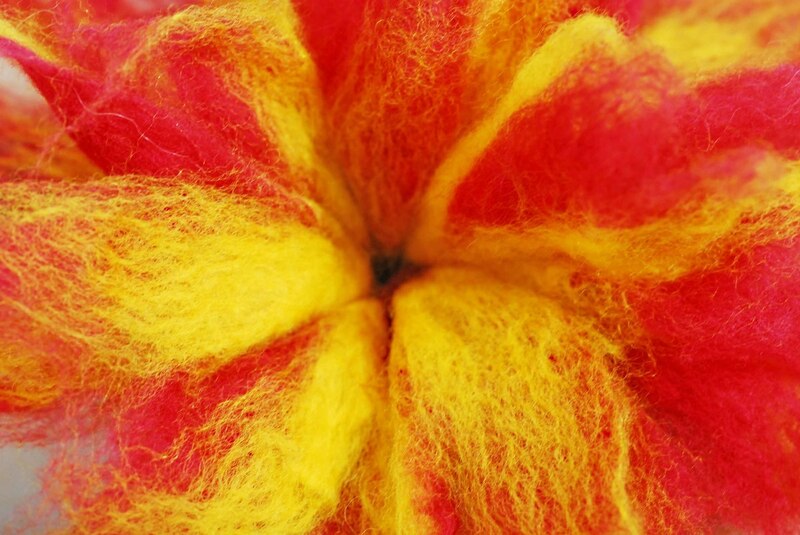 Working with wool/felt this way is absolutely fascinating. I love the finished product too. Your additions are certainly a stand out. Well done Sally. 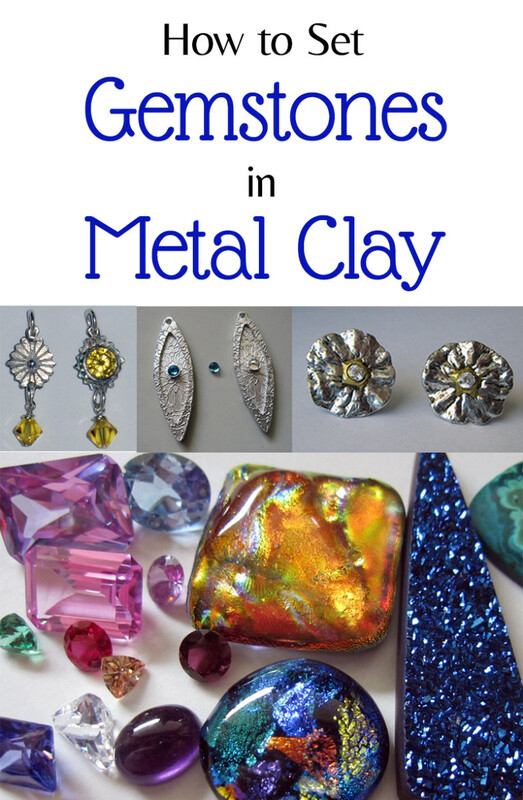 This was a delight to read as I enjoy making jewelry. Such great instructions with the perfect video. It is so relaxing and fun for me to design something special and then make it. I believe this is the first time for me of seeing felt beads. I am amazed at the beauty of them and the great possibilities of using them in different ways of expressions. I will share this with Twitter and Pin it on my repin board. You have a wonderful new week. Hi Sally. I work a lot with beads but have never made or seen felt beads before - they are pretty and make lovely jewelry. Your instructions and photos are very helpful and clear. Thanks for sharing this crafty idea. What nice Christmas gifts they make. I love receiving home crafted gifts and love to give them. Wow! I love this idea! I do value your creative craft. I found this hub to be very interesting, useful, beautiful and voted up! You are very welcome. I hope you enjoy your time spent together. Exactly! I've just had a thought - my granddaughter would love helping her mum with these too. Anything to do with making and getting sticky is right up her street! Thanks again. Thank you so much! Making felt beads this way is a breeze and as you say with the addition of some charm bracelet beads they do look individual and professional. I picked up my charms from a charity shop and I am sure you daughter can do the same. 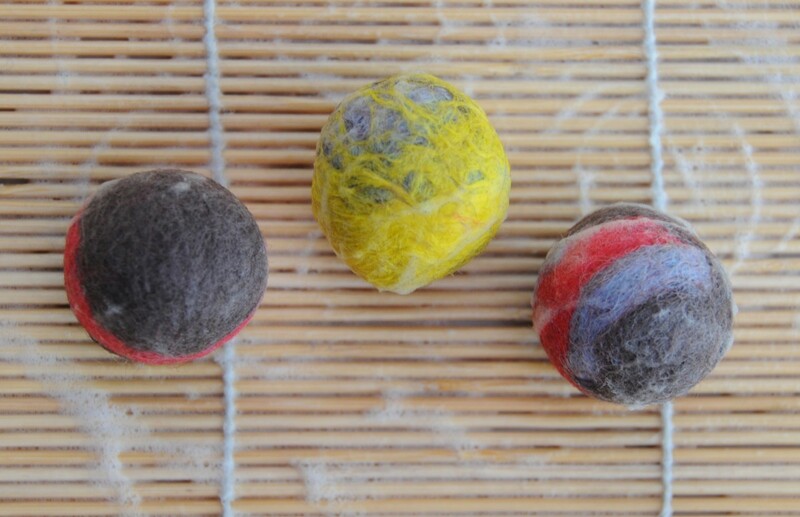 I hope she gets as much fun out of this method of making felt balls as I do. You actually don't need the patience of a saint but I always say, stick to the things which make you happy. These products look so professional. I was intrigued with the rolling process and it doesn't look as fiddly as I'd imagined. They all look beautiful. My daughter makes lovely jewellery from scratch or from charity shop buys and many look similar to yours but without the felt. She'll be interested to see this so I'll pass it on to her. She has the patience and skill to do this (which I don't!). Thanks for the great ideas. Love that you take the time to comment even if you say your artsy-crafty days have passed by. I did not think that possible! I always enjoy your tutorials, Sally. this would be great fun. You explain the process so nicely. Thank you for passing along these great ideas. Billy, thank you, your comment which is appreciated as always. I hope the crafty folk enjoy the tutorial. It is a busy time around here near Christmas but I do have a few more articles on the boil along with the home made fudge. I'm passing this on to the crafty people in our family. I'm sure they will love it. Good to see a new article from you. Nicely done as always. Happy Weekend to you, Sally. Oh, I love this idea! I have some small amounts of lovely colored wool roving but I didn't know what to do with it. This technique would be perfect, and I can see that this process makes beautiful beads. Thanks so much for posting and sharing. I love the possibilities of this technique!